One of the girls that is a form teacher was married last weekend and she invited the office. One of the guys is getting married to another one of the girls and this is a synthesis of the two experiences. 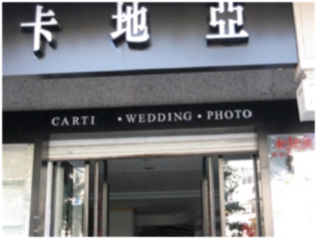 To say that the wedding is all Chinese is apt. It is fundamentally backwards compared to the European way. I remain confused. Having decided to do the deed, the Dress is purchased. The couple dress in their finery and are Photographed. The album of photos is then shared around the relatives and friends. Many of the photographs are severely staged, some against backdrops so it looks as thought the couple went somewhere exotic (New York, Paris, the Bahamas, sometimes all of these and sometimes in adjacent photos of a couple). I subsequently saw many such photos being taken in Qingdao in front of the largest church and down on the beach (but only the famous beach). This is the big affair. Everyone is invited. Effectively, this is the public witnessing of the couple’s pairing. (Not to be confused with the pair’s coupling, for those of you of in need of washed brains). The one I went to had about 250 guests in a huge room upstairs in a restaurant. Everyone was sat around at tables of about a dozen (and hardly a child in sight). Only the ex-pats had dressed up, plus the couple themselves. Everyone else was dressed as they would have been if not invited. The ceremonies, if you could call them that, were supervised by a professional MC, a slick operator – altogether too loud, intrusive and very ITV or Radio Two or Butlins BlueCoat. Quite gruesome. 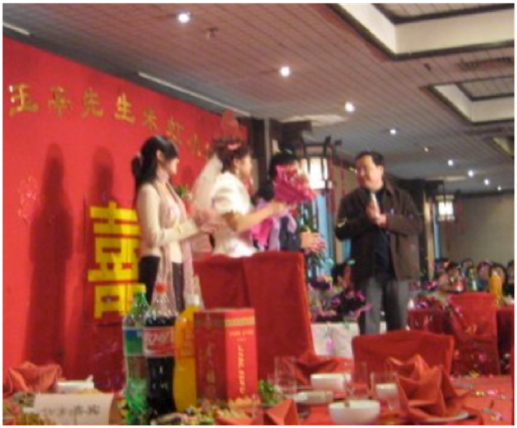 The couple, in wedding attire (so they need the clothes twice), met everyone on arrival at the door of the establishment. After some heckling from the MC they are paraded into the reception room and onto a small stage. For the next twenty minutes they were ridiculed (“teased” the locals called it) in front of their friends. There was much bowing and scraping in front of parents (some emotional tears at that) but the basic theme was immolation and embarrassment. The MC was accompanied by an electric organ / drum-kit and a selection of giant party poppers. All very low quality circus presentation and, really, remarkably excruciating to behold. The couple, in turn and not together, were lauded inappropriately by parent and by employer. It made the more uncomfortable parts of a British reception remarkably friendly even at its worst. The guests began to eat the splendid spread at no visible signal, probably just after the ceremonial and impressive pouring of a champagne-like bottle onto a compound stacking of glasses (six layers high?) and a cutting of a cake not subsequently tasted nor obviously shared. The ridicule ran down, eventually, with a collection of songs by the groom and anyone else who could be persuaded to make a fool of themselves. We foreign devils were expected—at no notice—to go join in with these gratuitous performances. I had asked in advance of the day if we were expected to do anything. That was when we became confused whether we were invited or not, as the invite was only verbal and not expressly made – and on the Thursday of the week with the wedding in it. Could it be a surprise? For the cost involved, we would, in our culture, expect specific and express invitation and detail. The spread was generous and copious. 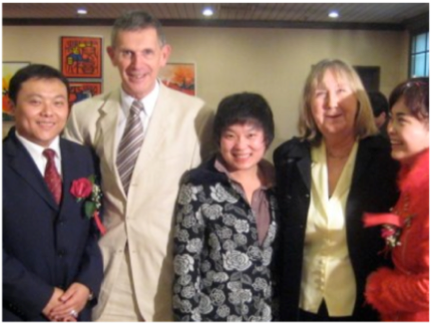 The couple came round to toast each table good health and be congratulated. The wedding dress had disappeared to be replaced with what we might call the going-away rig – so the Dress had a whole hour of wear since the photo shoot. Farewells began as soon as the food was eaten. In our case we were included in many photos (I saw few others given the same treatment) – probably because we are foreigners, possibly because of the standard of dress.. The MC was OTT, marginally rude and at the same time probably doing exactly what was expected. Both sets of parents suffered at his hands (and neither older couple were dressed up). 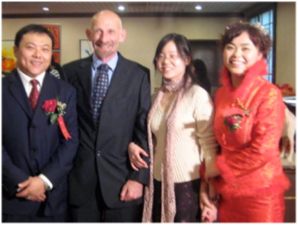 Thus the expat blokes were as smartly dressed as the groom himself. Almost; we didn’t have buttonholes. Confused? Me too. The British lad who is getting married (just Stage 3 to go now) was handsomely put off by much of the experience. Fortunately, his other half understands. I expect they’ll not quite get around to that part. Which makes their excellent photographs all the more important. So which bit was the wedding? When, quite, was the wedding? Which date is celebrated as an anniversary? Oh, and there was no honeymoon: the poor girl was given one day off beforehand and no days off in the following week. Like I said, I’m confused…. I am accused of cynicism and bitterness in this description. I recognise neither attribute on this occasion. It is, in my mind, a fair description of what I saw. 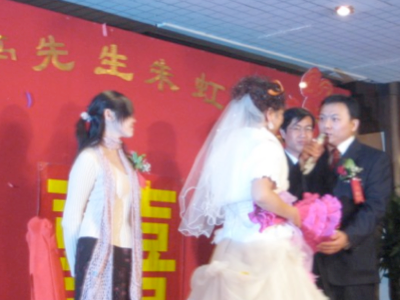 Many agree with me, including—and more significantly, to me—those of an age likely to be married in China in the next five years. If you ask me to tell this orally I would tell it more slowly and I would describe more of the anguish experienced by the couple and their immediate family. Because there is nothing commonly equivalent in Britain, I have nothing that comes to mind to compare it with (or even compère it with), unless you have seen worse than I have on a stage.